Our representative will meet the guest at Paro Airport & transfer them to Thimphu. 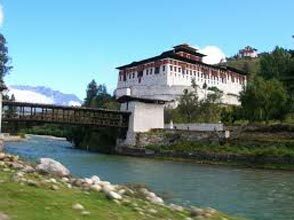 Enroute visit magnificent old monastery Tschogang Lhakhang which built in 15th century and also stop on Chuzom the beautiful confluence point of two rivers of Bhutan known as Paro Chu –Wong chhu. Etc. Relax an Evening & Stay Over Night at Thimphu. Day 2: Thimphu Local sightseeing. After morning breakfast the guest will be transfer to Thimphu . The capital city of Bhutan . Throughout the chilling weather, greenery & the spectacular view of mountain range take a break an hour at Dantak Canteen. At evening check into Hotel & stay overnight at Thimphu. Day 3: Transfer to Paro (via) Punakha. After morning breakfast the guest will be transfer to Paro . It is located at 7483ft above from sea level. It is specially known for the one and only international airport in the country. Enjoy the mesmerising views of lovely nature. Take a short break at Dochula Pass .Which is located at altitude of 3100 Mtrs above from sea level. After day visit of Punakha .Resume the journey to Paro. Check into Hotel. Relax at evening & Stay overnight at Paro. Day 4: Paro local sightseeing. 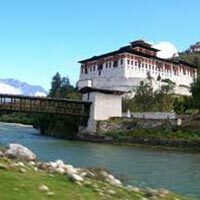 After morning breakfast the guest will be proceed to visit local sightseeing of Paro like Drukgyal Dzong , Taktsang Monastery ( View Point ) , Paro Rinpung Dzong , Kitchu Monastery , Paro Museum , Ta Dzong , Bird View of Paro Airport , Etc. Evening check into Hotel and free to stroll around & stay overnight at Paro. Day 5: Transfer to Paro Airport. After morning breakfast the guest will be check out from hotel and our representative will safely transfer them to Paro Airport. Finally, end the Bhutan tour and tour forwarded to next destination.